nubia’s first gaming phone — the Red Magic (review) — was a strong device, but it wasn’t competitive enough due to its adoption of the old Snapdragon 835 chipset. In a bid to correct that perhaps, the company has now unveiled the Red Magic Mars, which sure enough has the latest SD845 at its heart. But what will really take your breath away is the amount of RAM in its top variant — 10GB. While you could argue whether that much memory is needed or not, but there’s no denying that the Red Magic Mars is indeed a strong rival to the ROG Phone (first impressions), which has recently launched in India. Let us give you a thorough comparison between the two to see which one’s worth your dough. It’s a known fact that gamers love their equipment to look flashy, and hence both the phones have made it a point to add LED lights on their rear surfaces. And these are RGB in nature, which means you can change their colours according to your choice. While the ASUS device offers a glowing ROG logo on its back, the Red Magic Mars has a rather stealthy LED strip on the centre of its back surface. Both being gaming phones, they have been blessed with shoulder triggers that come in handy while playing shooters or racing games. But the implementation of this concept is much better on the ASUS handset since its triggers are ultrasonic in nature, while those on nubia device are actual capacitive keys. These phones also offer haptic feedback during games, just like console controllers. No gamer wants their phone to get heated after prolonged usage, which is why both these devices ship with cooling systems of their own. The ROG Phone adopts a vapour-chamber cooling system, whereas the Red Magic Mars delivers a dual heat pipe and convection cooling. Air vents also make their way onto their back surfaces. When it comes to accessories, the ROG Phone has a special connector on its side surface, which can be used to pair it with different things like a dual-screen dock, a mobile-to-desktop dock and even a console-style controller. The nubia Red Magic Mars connects to its optional Nintendo Joy-Con-like controllers via Bluetooth. Coming to displays, ASUS has blessed its gaming handset with a 6-inch AMOLED monitor bearing a resolution of 1,080 x 2,160 pixels and a refresh rate of 90GHz, which is mighty impressive. On the other hand, the Red Magic Mars has gone for a 6-inch IPS LCD with a resolution of 1,080 x 2,160 pixels. Both the phones grab headphone sockets as well as rear-mounted fingerprint scanners, and they charge via USB Type-C ports. The Snapdragon 845 chipset can be found inside both these phones. However, ASUS has overclocked the octa-core processor of its ROG Phone, resulting in its frequency going up to 2.96GHz rather than 2.8GHz. The same chipset means both the phones even bear the same GPU, which is the top-of-the-line Adreno 630. In India, the ROG Phone is only sold in the form of a 128GB storage model that comes with 8GB of RAM. But the nubia Red Magic Mars goes a step above, with its top model delivering 256GB of storage and 10GB of RAM. Its 128GB storage version offers 8GB of RAM, whereas its 64GB storage variant ships with 6GB of RAM. None of the two devices offers microSD card slots. The ROG Phone runs an Android Oreo-based custom ROM, featuring stuff like a gaming mode and a ROG Gaming Center app meant for showing CPU and GPU frequencies as well as the phone’s temperature. An X-Mode, which allows you to set the CPU clock according to your liking is also present. The Red Magic Mars runs the Android Pie-based Red Magic OS. The software offerings of this UI are more or less similar to those of the ASUS device. The ROG Phone has been equipped with a dual-camera system consisting of a 12MP main shooter and an 8MP secondary snapper that’s meant for wide-angle photography. Its front camera too is an 8MP unit. The nubia Red Magic Mars has a single 16MP camera on its back and an 8MP camera on its front. A 4,000mAh battery has gone inside the ROG Phone that supports fast charging. As for the nubia device, it gets a slightly smaller 3,800mAh cell which also comes with quick charge support. 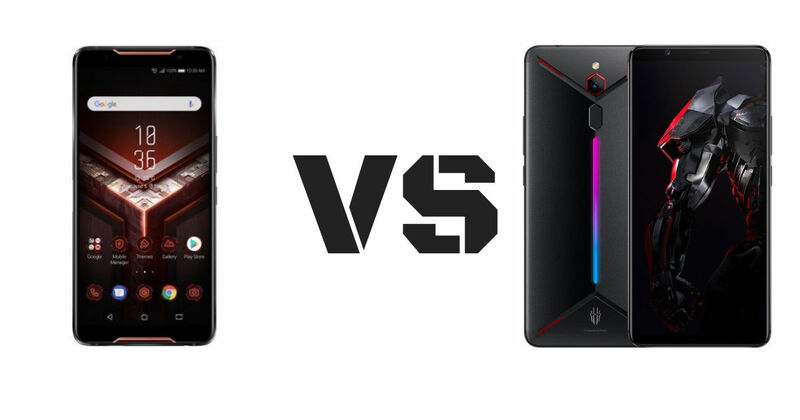 Despite both these offerings being gaming phones, there’s a big price difference between the two. The ROG Phone makes no compromises in any department, which is why its high price tag of Rs 69,999 is justified, and it’s no doubt the better device among the two. But that doesn’t stop the Red Magic Mars from being an excellent device, and the fact that it can offer so much stuff at such a low price (approximately Rs 32,500) is commendable. Sadly though, it remains to be seen if and when the nubia handset will be making its way to the country.